Some researchers try to identify archaeological traces of symbolic thought among our ancestors in Africa, Europe, and the Middle East. These researchers believe that if they can find such traces, they necessarily imply that the people concerned had a sufficiently elaborate communication system to share with one another the meanings behind the symbols they used. (In contrast the methods of manufacturing tools could presumably be shared by simple imitation.) In short, these people must have had a language. The material artifacts of a symbolic culture may include personal ornaments, decorated tools, engraved bones and stones, graves, tomb objects, notation systems, musical instruments, and so on. All of these objects bear representations that have no iconic relationship with their meaning. They can also refer to non-instrumental behaviours that occur in human populations. Language certainly constitutes an important asset for survival, but less so for the individual than for the group. Language is above all a shared attribute of a group of individuals, and in this regard, it favours the selection of groups and not of particular persons. This is the case for any animal community that has an effective means of communication. For example, like humans, bees and ants can react as a group to an outside event, thus becoming the subject of evolution by selection of groups rather than selection of individuals. The origins of language have given rise to many debates over the years. In 1886, the Linguistics Society of Paris even declared this question irresolvable and thenceforth refused to accept any more papers on the subject. Because spoken language is by definition impermanent, we have only indirect evidence of how it emerged. That is why so many different hypotheses have been offered about the origins of language, each one more imaginative and speculative than the one that preceded it. First, there are what might be called the vocal theories of the origins of language. According to these theories, about 100 000 years ago, certain changes in the mouth and the pharynx (follow the Tool module link to the left) combined with an increased brain volume to give human beings voluntary control over vocal outputs that up to then had been more like instinctive cries. There are many variants of these vocal theories. Some authors speculate that human language arose from the development of onomatopoeia: the imitation of sounds in the environment. Other authors say that language developed from cries of joy, cries of pain, and other involuntary exclamations. Still others, including Charles Darwin, argued that people developed oral language by using their mouths to imitate the gestures of an existing language for which they had until then used their hands. According to another hypothesis, the use of arbitrary symbolic sounds developed from the cries that primates used to alert one another to the presence of predators, of edible or poisonous foods, and so on. 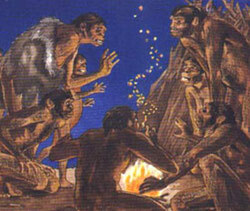 Other yet more sophisticated theories propose, for example, that human language became so elaborate because early humans’ cries and vocalizations revealed their mental states, and so some individuals learned to imitate these sounds to obtain certain selective privileges and advantages. Another school of thought posits the gestural theory of the origins of language. This theory holds that one of the first effects of the transition to walking on two legs was to free the upper limbs and make them available for gestural communication. Subsequently, vocal language developed, thus freeing the hands for other uses. Research on the sign language used by deaf people has yielded some arguments that support the gestural theory. These studies have shown that from a grammatical standpoint, sign language is just as sophisticated as spoken language. They have also shown that sign language calls on the same “language areas” in the left hemisphere as spoken languages do (follow the Tool module link to the left), and in particular Broca’s area, which lies very close to the motor areas that control the arms and hands. The gestural theory of the origins of language would also explain why chimpanzees can learn the rudiments of sign language but cannot acquire spoken language. Gestural theory might also explain why the stone tools used by the first hominids evolved so little for nearly 2 million years, even though these early humans’ brain size was increasing. If they were using their hands to communicate, perhaps that made them less available for refining their stone tools. The proponents of the gestural theory of the origins of language believe that the transition to spoken language probably proceeded gradually until about 50 000 years ago, when spoken language became far more predominant, thus permanently freeing the hands to accomplish the staggering technological and artistic advances of that period. 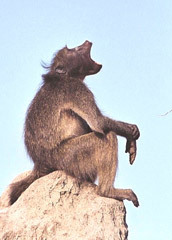 According to another set of theories, language emerged from the complexity of the social world in which primates lived. In this regard, these theories contrast with the other theories that emphasize exchanging information about the physical environment for pragmatic purposes such as more effective hunting. British anthropologist Robin Dunbar’s “gossip” theory is one of these theories based on social complexity. Around the mid-1990s, Dunbar pointed out that the majority of people’s conversations are devoted to gathering news either about the people they are speaking to or about third parties: in other words, to gossiping. For Dunbar, the primary function of language therefore is to exchange information about the individual’s social environment: who is trustworthy, who has made alliances with whom—in short, the usual gossip. 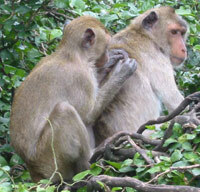 In primates, it is mutual grooming that serves this social function, strengthening hierarchies and promoting reconciliation after conflicts. Dunbar believes that during hominization, as the number of individuals in each group increased, language simply became more effective than grooming as a tool for social cohesion. Other authors, such as French sociolinguist Jean-Louis Dessalles, assert that humans began to talk because they are first and foremost political animals. In this sense, the great advantage that language conferred on early humans would have been the ability to persuade other people to form alliances, or to accept the truth of something that was not happening before their eyes. Thus language would have emerged because hominids needed a way to choose their allies within groups whose social structures were becoming more and more complex. Still other authors, such as French cognitive linguist Bernard Victorri, emphasize that at a certain point in its evolution, the human species experienced the need to formulate laws to manage the crises arising from the increasingly complex mental lives of the members of the social group. These laws were expressed in myths such as are recounted in all human societies—“This happened, and it could happen again, but it must not.” Such tales may have promoted the emergence of the narrative complexity that is unique to the human species. But besides the nature of the mechanisms by which language originated, one other question has been haunting linguists for many years: whether language was invented just one time, or many.